Topics: Carbon Monoxide, Gas Safety, Gas Safety Faqs, Domestic Gas, and Gas Appliances. 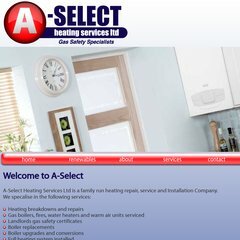 a-selectheating.co.uk A Select Services - Heating Engineers Worcester,Boiler ..
a-selectheating.co.uk Contact A Select Heating - Heating Engineers Worcester,Boiler ..
ns2.123-reg.co.uk, and ns.123-reg.co.uk are its DNS Nameservers. It is hosted by Atls-lb (England, Leeds,) using Apache web server. Its IP Number is 94.136.40.103.